Nonprofits have long enjoyed our goodwill and continue to hold an important position in the community. Public and private investment in projects led by nonprofits has been integral to the welfare of our society. For a long time, funding nonprofits has been seen as a charitable act. Institutions that made such investments did not look very closely at the financials or follow up to assess the impact of the initiative. Besides, they relied primarily on subjective judgment while making a call on where to invest, following the big names and throwing their weight behind causes that dominated the public imagination. Over time, the nonprofit sector has grown exponentially and this has forced all the participants to evolve, adapt, and become increasingly sophisticated in their approach. Funders, one of the most important stakeholders in this sector, have become increasingly demanding. Mere adjectives, fancy decks, and visionary talk won’t make the cut any more. Funders want to have a certain degree of confidence that the project will reach fruition along the established timelines and within the agreed financial terms. If a nonprofit is not able to meet the objectives, the funders take their funds and go elsewhere; there is no dearth of options out there. This is where data comes in — cold, hard facts that separate the grain from the chaff. On subjective matters, it is often a case of your word against mine, but it’s harder to argue against data. Numbers speak for themselves and funders are increasingly showing a preference for nonprofits that are more data-driven in their approach. To illustrate the importance of data, let’s have a look at the difference that it can make in three major areas of your work and help you present your case more effectively as you reach out to funders for that all-important grant. The ideas are drawn from management principles that were developed in a corporate setting, but the lessons can be immensely effective for nonprofits too. Establishing your goal is the first and foremost agenda for any initiative; it sets the tone for the entire project and can often be the difference between success and failure. A vague objective statement can leave the team directionless, being overambitious could mean that you end up in disappointment, and if the goals and the success indicators are not well-defined, how would you even know success when you see it? An objective must be Specific, Measurable, Achievable, Realistic and Timely — S-M-A-R-T. The SMART framework is a useful toolkit that helps us take an objective, scientific approach to goal setting. An objective should be well-defined in its scope, giving clear specifics on what the project hopes to achieve. Every major operational area must be tracked using measurable parameters that can serve as key indicators and help keep a tab on progress. The team must do a thorough analysis on similar projects that have been undertaken in the past, analyze all variables through an extensive feasibility study, ascertain if the objectives are achievable and realistic within the agreed time frame — and then stick to the plan. SMART objective setting, backed up with facts and an undertone of logical, reasonable analysis of good, clean data, goes a long way in making the funders believe in the eventual success of the project. Once your goals have been established and the wheels have been set in motion, keeping a track of your progress to make sure that you don’t fall by the wayside is imperative. Deming’s Plan-Do-Check-Act cycle can be a useful framework to put these ideas in perspective. When the plans have been laid out and you get the operations underway with all your strength and vigor, it is important to take a step back and monitor your progress by measuring certain parameters that can serve as the key indicators. Analyzing this information to make fine incremental adjustments to your modus operandi can help you keep your project on track and would give the funders a great sense of comfort to see that the path that had been charted out is being followed to perfection. Even the smallest of milestones are important when you set out on a thousand mile journey. Being data-driven at your very core is critical to this approach. that battles win you the war but, while you’re engaged in tackling the day-to-day operational challenges, you can often overlook your long term strategic goals. Large corporates (and nonprofits) that work on multiple projects at a time are even more susceptible to this. To help organizations manage their portfolio of offerings effectively and make efficient use of the finite resources at their disposal, BCG came up with a Growth-Share Matrix that took the world by storm. Categorizing products and services based on growth and market share helped organizations focus on fueling the stars (high growth – high market share), examining and nurturing the question marks (high growth – low market share), milking the cows (low growth – high market share) and doing away with the dogs (low growth – low market share). This is a very elegant system that worked beautifully in streamlining large organizations and helped them keep their eye on the ball. These principles can be very useful to nonprofits as well – albeit with a slight modification. Since nonprofits don’t always talk about growth and market share, it would be more useful to think in terms of Impact and Outreach — parameters that mean a lot more in defining the success of nonprofit endeavor. Adapting the Growth-Share Matrix to form an Impact-Outreach Matrix can help nonprofits streamline in a manner that has served large corporations so well over the decades. Continuing to generate goodwill through the cows (projects that have slowed down over the years but reach a vast number of people), the nonprofit can direct its incoming resources to the question marks (promising projects that have shown high impact with a potential to expand their reach) and reinforce the stars (the successful high impact – high outreach projects) through a steady influx of funds. Nonprofits that show the pragmatism to cut losses on projects that don’t turn out as expected and direct their efforts to areas with maximum potential are a very attractive proposition to funders that look for long-term partnerships. Being able to act with such prudence and foresight will not be possible without capturing data from every aspect of your work and using it power your decision-making at every step. With clear goals, incremental operational efficiency and a clear, long-term strategy, funders are going to love you. 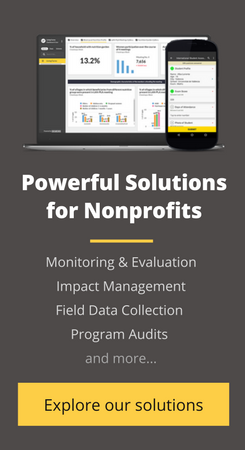 Funders insist on data – and this is probably the best thing that has happened to the nonprofit ecosystem in a long time. Read on to know more about the fascinating world of data science and its potential even in fields as challenging as public health. Collecting data in the field is always easier with a mobile app. We’ve helped over 150 partners collect over 20 million data points through our mobile data collection app Collect.